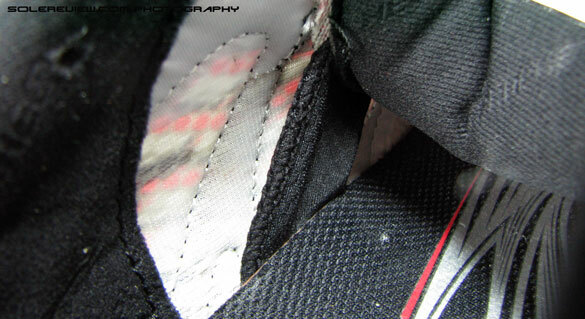 Midsole: Full length Mizuno Wave plate construction, midsole foam layer. 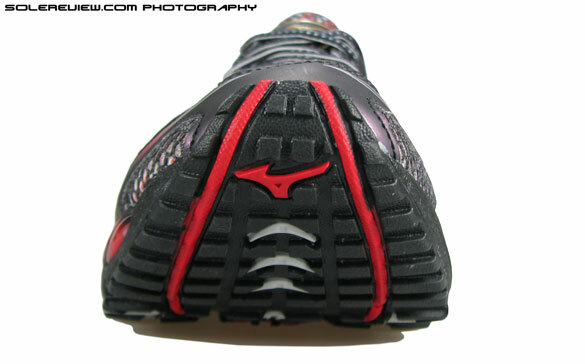 Outsole: Carbon rubber - Mizuno X10. Mizuno's flagship shoe at $200. What you get in return is a Wave plate unit with multiple patents and a great upper, which also looks the part. Downsides are the weight, the pungent industrial smell from the midsole, and well, the price. 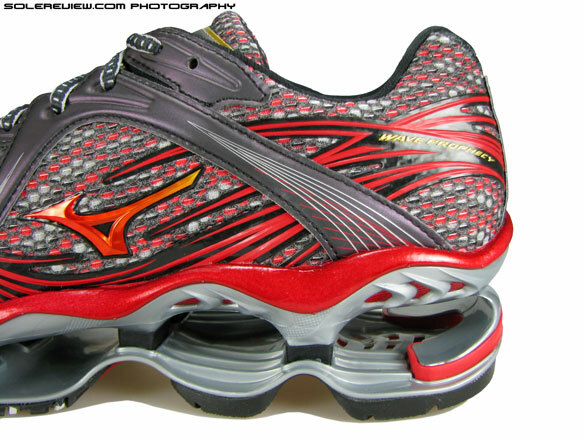 It attracts a lot of attention, we must give Mizuno Wave Prophecy that. We’ve had the Prophecy for the last couple of months, and every now and then we would wear them to work. On the way up in the elevator, people would stare or at least make a furtive glance at the Mizuno. Sometimes you make conversation. On the sprint track, the coaches and runners would notice the Prophecy the first time we’d pass them by, and then try to get a closer look the next time we run past them. In an athletic shoe store, the employees would gawk at the shoe with undisguised curiosity, and most of them would end up asking, ‘Hey, nice shoes. Where did you buy them from?’ That is how radical the Mizuno Wave Prophecy looks. The heel to toe Mizuno Wave unit is the visually dominant area of the shoe, and it is topped off with a metallic red midsole, a spacer mesh upper with an alternating red-white-black color scheme, and welded overlays which goes over the upper like masterful Japanese calligraphy strokes. 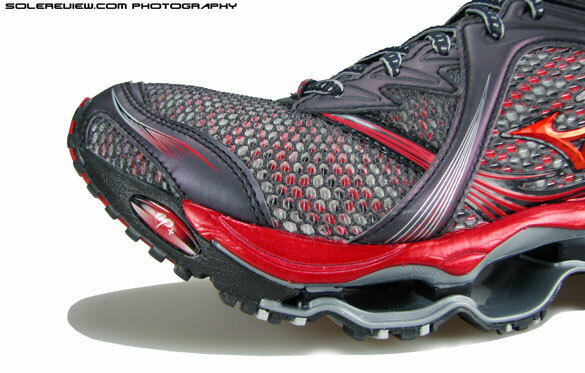 The Mizuno Wave Prophecy was released in May 2011, which makes us ask, why now? Nike Shox, the Adidas A³ and Megabounce were all the rage in the last decade, but now the sun seems to have set on the ‘columnar cushioning’ empire, save for areas in South America, where we hear these kind of shoes do well. 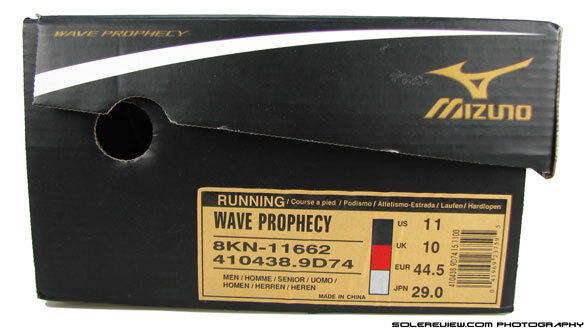 If the Wave Prophecy had been released 8 years earlier and at a tag $70 cheaper, it would been extremely successful. Now with the entire running shoe market trending towards minimalist, ‘let-your-foot-work-for-you’ shoes, it is not the probably not the best time to drop in a shoe which does exactly the opposite of what runners have to come to expect. 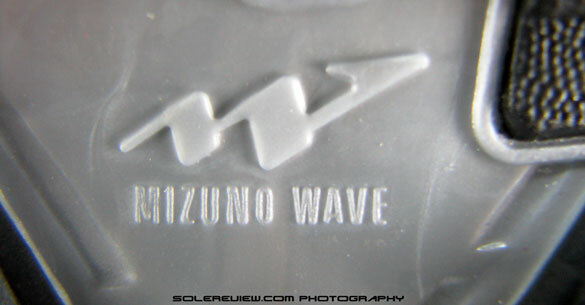 The answer lies in the fact that Mizuno took a decade to get the Wave Prophecy to the market. The official press release says ‘seven years in the making’, but based off our research on patent applications filed by Mizuno in Japanese and US patent offices, the story started in 2001. Which makes sense, really. Nike Shox had been released in 2000 after 16 years of research and development (Popular science Magazine, Nov 2000) and it seemed the next big thing in the running shoe game. For the first few years, it actually was. Mizuno’s wave technology debuted in 1997, and Nike’s initial success with Shox might have led Mizuno to start working on a full length wave cushioning. The first patent (A-2003-9906) for a heel only based Wave unit was filed in Japan/US in June/August 2001, unmistakably an evolutionary step towards the development of the full length Wave plate. The patent is published in a year and half, and soon after, the first Mizuno Wave creation hits the shelves. Another patent application (A-2003-339405) is filed with the Japanese patent office, this time for a full length Wave cushioning platform. 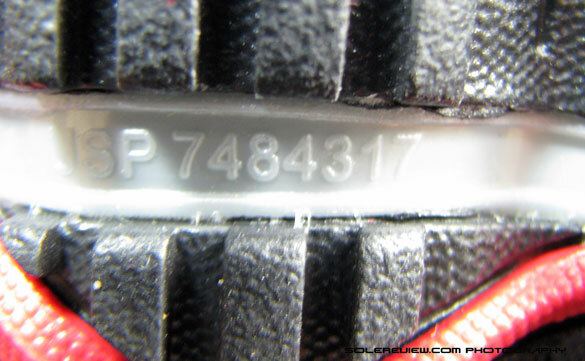 And finally, in December 2005, the patent application(7484317) for the present day Mizuno Wave plate was filed with the US Patent office. If we read the details right, the patent was granted in February 2009, a good three and half years after the application was filed. But meanwhile, Mizuno started tweaking around with the Wave creation unit to bring it closer to the present day plate design. The convex cushioning structure seen in the Mizuno Wave Prophecy made its first appearance in the Wave Creation 8 in 2007. 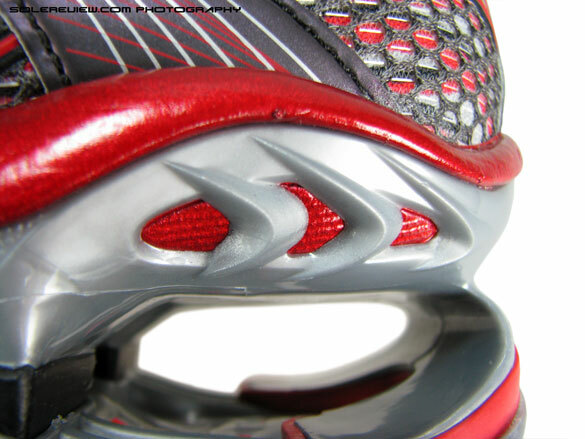 After the patent confirmation, the 2011 Wave Creation 12 featured a heel Wave plate near identical to the rear section of the Prophecy. 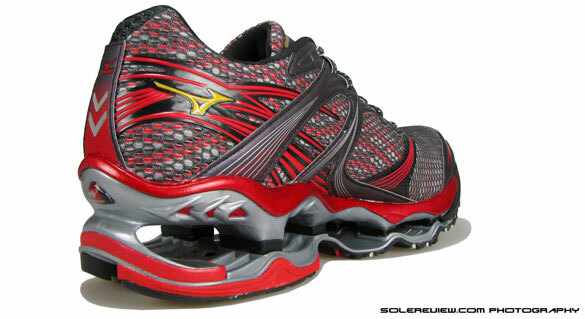 A few months later, the Mizuno Wave Prophecy was released. Kenjiro Kita and his colleagues at Mizuno would have been very relieved – in 2001, they would not have imagined the paperwork they would have to push to get the $200 Prophecy out to the stores in a black cardboard box. Given the running shoe industry’s recent leanings towards all things minimal, the Mizuno Wave Prophecy is most certainly an anachronism. And ironically, the name has been a poor prophet of the shoe’s commercial success. We are yet to see another runner in these, and even the store assistants at Fleet Feet (where we bought the Prophecy from) said there weren’t many people buying them. The Prophecy reminds me of the Gel Kinsei and the Adidas a1 – other shoes created with a lot of effort and little marketplace success to show for.That said, there is a silver lining to these stratospherically expensive shoes. These shoes should be looked at the same way the world looks at concept cars. Concept cars eventually don’t make it to the local car dealerships, but it is pretty much a blank cheque to the car designers on what they can do with the car. Best trims, choice of metal, advanced engine features and electronics – you get our drift. So later on, when the curtain’s down on the Tokyo motor show, bits and pieces out of these concept cars start finding their way into mass production cars. It might be that steering system. Or the lights. Contour lines. Navigation system. So our point is, these experiments might not translate into instant cash register ka-chings, but serve as an inspiration point for other products downstream. 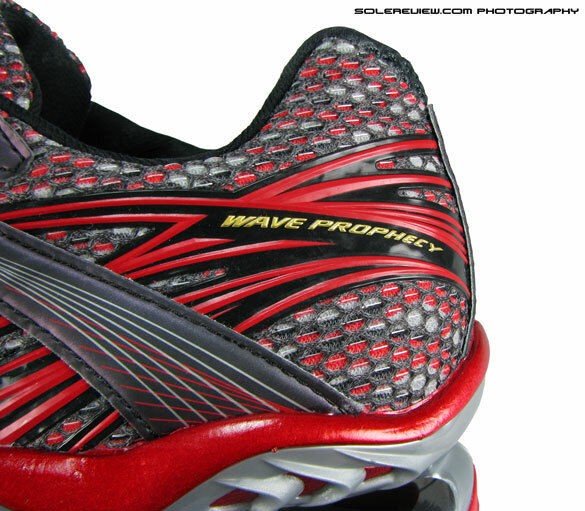 From that perspective, the Mizuno Wave Prophecy very much serves the purpose. 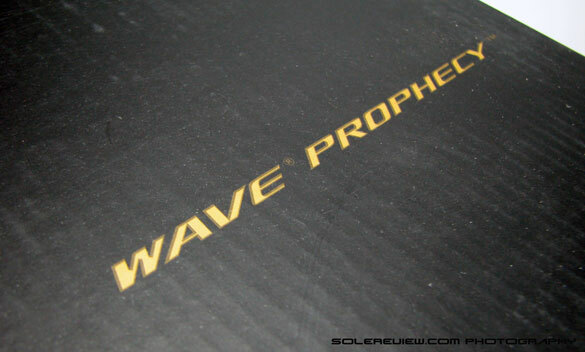 But for now, what do we, reviewers of high priced foot coverings, think about the Wave Prophecy after wear testing them? The shoe costs $200, which is a serious amount of cash, considering even the most expensive running shoes stop at $160-180. So our expectations of the shoe were sky high, and we tested the Prophecy over multiple 5k runs, casual walking around and stationary training exercise sessions. Let’s begin with the upper first, which really, really impressed us. The upper base is a semi-stretchy, dual layer open mesh, with a quality level which we don’t see often even in $150+ running shoes. 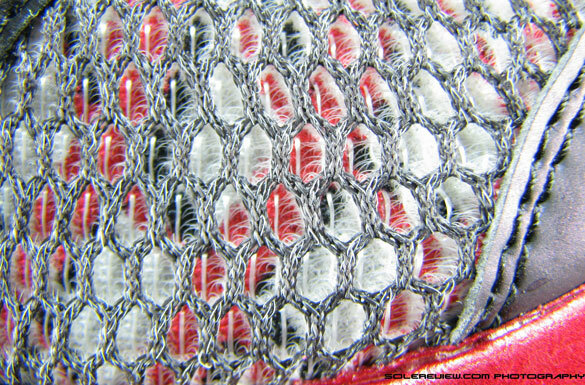 The black, red and white of the mesh mixes together to result in a dramatic visual effect, and sinewy synthetic molded overlays and welds add an extra dimension to the aesthetic package. Use of this mesh results in an amazing fit – it keeps the foot securely in place, yet is stretchable, well ventilated and avoids constriction. 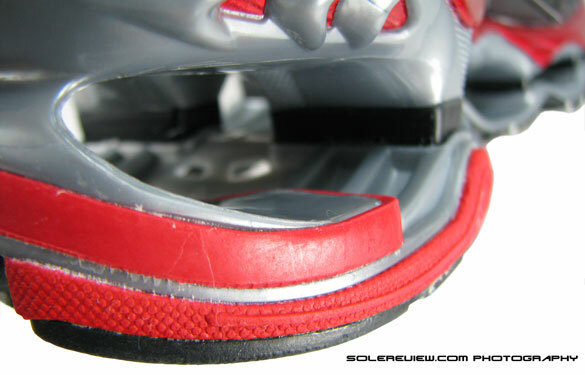 Inside, two stretch bands wrap around the midfoot, enabling mild lockdown, and prevents the tongue from moving around. The collar and tongue is not plushy padded, yet wraps snugly around. 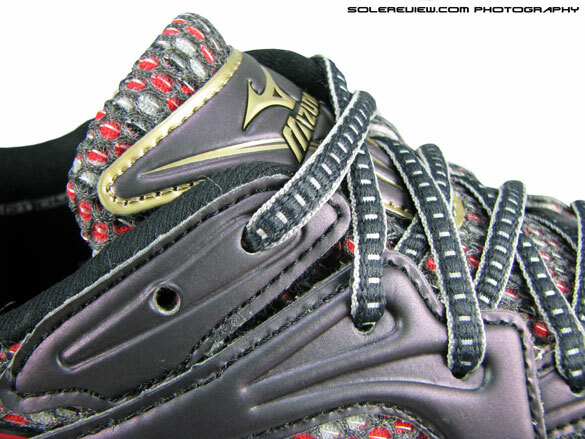 There are some nice touches of detail, like the embossed ‘Wave Prophecy’ and the Mizuno logo on the fabric lining. Don’t recall when was the last time we saw that, either. Paradoxically, the snug upper is also roomy, and should be able to accommodate regular D and E widths. A molded sockliner sits inside the upper – nothing outworldly about that one, though. Just a good layer of molded open cell foam with printed graphics on the top. But like they say, everything is a sum of parts, and the Mizuno has made a shoe upper which is near perfect in fit and feel – and going back to our analogy of concept cars, there are a lot many things which can be taken downstream from the Mizuno Wave Prophecy. Now down to the sole unit – born out of a decade long toil of innovation and patent grant bureaucracy. The Wave sole unit works on the principle of deformation; cushioning and impact absorption is achieved by four convex openings or gaps which compress (and later rebound back) when weight is applied on them. The sole unit also has an extremely high toe spring (distance from the toe tip to the ground) which results in the body being propelled forward once the weight transfers to the front of the shoe. Once the weight reaches the forefoot, the foot just ‘tips’ over in the forward direction. 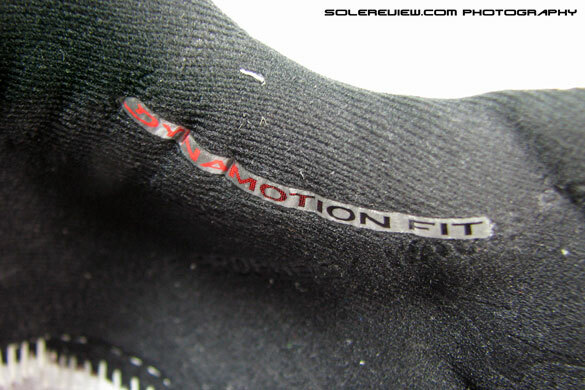 This results in a feeling of the shoe ‘pushing’ you ahead, though this sensation diminishes as you pick up speed. 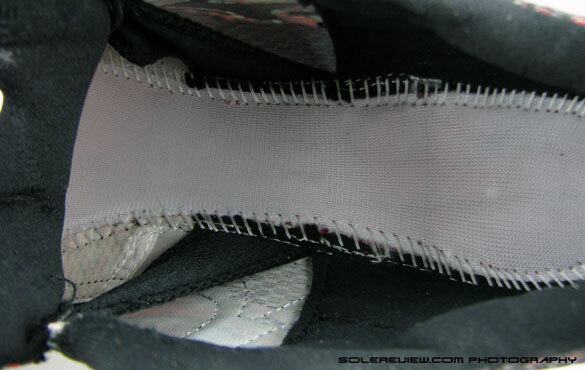 The heel area has a LOT of give or sink during heelstrike, even for a medium weight runner. That immediately resulted in stress on the shin, and after each of our test runs, we experienced mild sore shins for 10-15 minutes after the run was over. The heel sink is even more pronounced when the weight is increased; all pointing out to the fact that the Prophecy isn’t cut out for speed runs. This is a shoe for conditioning runs, and for heavier runners who are looking for something to effectively cushion their body weight. To give credit where it is due, the Wave unit is thoughtfully designed. 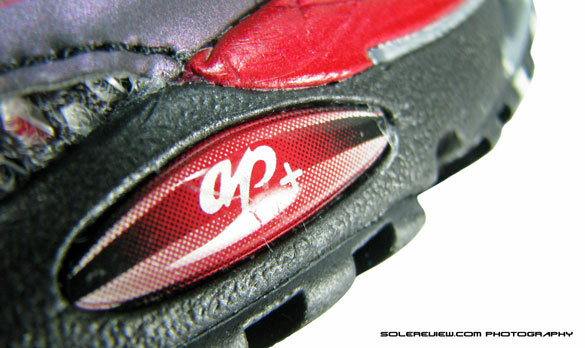 With the significant heel compression, we were surprised by how well the Prophecy kept its line. 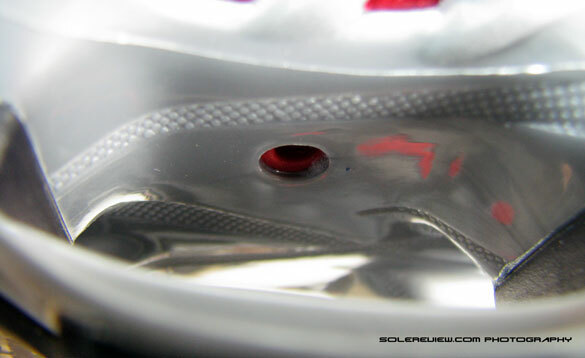 The shoe owes its stability to the uncovered space right under the heel, between the two rubber sole components. During the heelstrike, the weight tends to stay in the center, hence setting the foundation for a forward weight transfer. This guidance area extends right up to the midfoot, leaving exposed areas showing the hard, silver Wave layer. 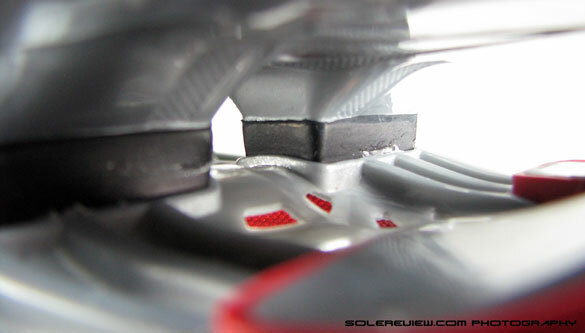 Small, rectangular rubber pieces connect two layers of the plate, allowing for some damping as well as forward shear (akin to Adidas Formotion). The forefoot is amazingly cushioned and flexible for a full length Wave unit, helped by a deep flex groove and the rubber connectors. 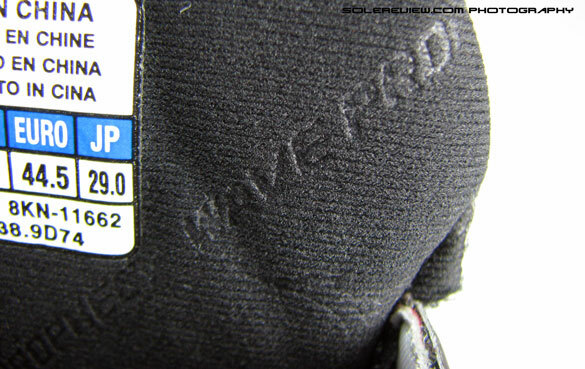 Between the first plate and the upper lies a layer of midsole foam which Mizuno calls the AP+ (Advanced performance) midsole. It is painted over with a metallic red which looks great, but smells like a can of paint, literally. A very strong, noticeable smell, which reminds us of the inflated rubber toy smell in the 80’s. The overall surface area of the outsole is reduced due to the high toe spring and grooves in the heel and the midfoot, and Mizuno has tried to compensate, with small, sharper rubber lugs. It does care of the traction on dry, debris free surface, but step into some amount of soil, and it quickly clogs up the space between the tiny lugs, reducing grip over the surface. We hope that is something Mizuno takes care of in its re-design, if the Prophecy continues to be in the future line-up. If you’ve already had a peek at our ratings, you’d notice we’ve given the Prophecy a rather low rating of 3/5, in spite of the eloquence we waxed about its near perfect upper, the decade long struggle and the thoughtfully designed Wave unit. That is where the ‘cost vs. value’ equation comes in. The Mizuno Wave Prophecy is a running shoe; and the question is, ‘how good a running shoe it is over a $140 one?’ We found that question difficult to answer. Shoes at $130-150 perform, fit and feel as well as the Prophecy, and purely, from that point of view, we say nay to the $200 pricepoint, regardless of the number of patents the Prophecy has to show. But like we said before – the silver lining is that we should see a trickle-down effect of the work that has gone into making the Prophecy, and that’s redemption enough.